Disc Golf - What Is It? 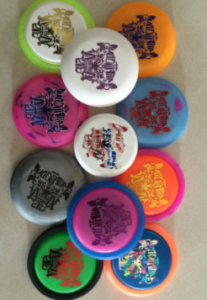 - OWOSSO Graphic Arts, Inc.
Home › Blog › Disc Golf — What Is It? 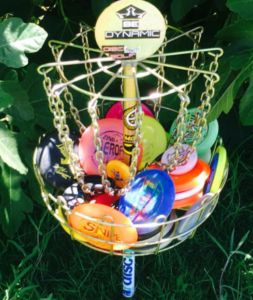 Disc Golf — What Is It? Disc Golf is played much like traditional golf – the object is to complete each hole in the fewest number of throws. Instead of using a ball and clubs, players use a flying disc, or Frisbee®. The game started with people aiming their Frisbee® at various targets, such as garbage cans, trees, light poles and other readily available items. Today, according to the Professional Disc Golf Association, there are thousands of courses around the world. There are teams/leagues popping up all over and over 86,000 members of the Professional Disc Golf Association. Suitable for school age to senior citizens, and all fitness levels, Disc Golf is the perfect lifetime fitness sport. If you can throw a Frisbee®, you can play Disc Golf. What does OWOSSO have to do with Disc Golf you might ask? We are the foil stamping die maker for leading disc manufacturers in the U.S. Our magnesium dies produce a crisp, foil stamped image on the disc. Zing Mini Discs are primarily used as markers in the game of Disc Golf. Zing makes five different competition sizes as well as a “micro” size that fits snugly over a soda can to keep bugs and bees out of your beverage. Many of their mini discs have been thrown over 350 feet. They’ve been in business for over 25 years servicing small businesses, schools, hospitals, doctor’s offices and especially Disc Golf. Craig Myers, Foil Mixologist at Zing had this to say: “I exclusively use OWOSSO for my die-making needs. I appreciate the fast turn-around and great customer service. Prices are very affordable and the quality of each die is impeccable”. So, if you’ve ever wondered what those baskets at your favorite park are for, now you know. You might want to swing by your local retail store and pick up a disc or two. 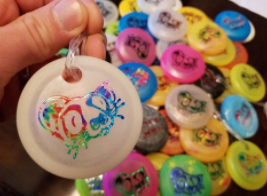 If you’re having an event, consider ordering some custom discs from Zing. Who knows, you might just perfect the Tomahawk throw!